I really like the look and they felt comfortable for the 2 minutes they were on. However, there Wide is really really wide. Love them. Look as good as in the picture.Have only had a week or so but they seem to be built well and are very comfortable. These are my second pair of Chamaripa elevator shoes (I also own the Total Motion Desert Boots) and they're definitely worth the cost. Somewhat stiff straight out of the box, but the cushioned footbed and flexible sole were comfortable right away. I appreciate the slightly larger size as I wear inserts and thick boot socks. I'm looking forward to wearing these to work all winter. They look so good you hardly notice the dog hair on my floor. Arrived soon!The fit a bit large. I'm a size 10 and I should have bought a size 9. Color is classy and the boots feel decently built. I plan on wearing them all winter as a casual dress boot. 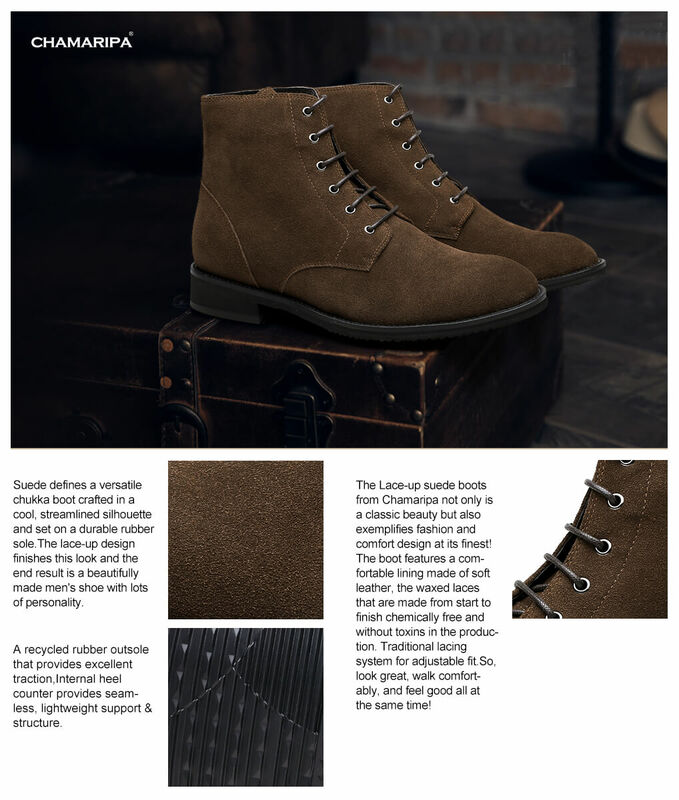 Ordered these Chukkas for my son, They are really comfortable and he wore them for hours the first time he put them on and he experienced no pain from it. very comfortable elevator boots!!! Recommend!!! I haven't worn Chamaripa shoes in years, but remembered my last pair were comfortable and high quality, so I gave these a shot when I found them for a good price. They look and feel great. I honestly can't remember the last time someone complimented me on my shoes (I'm not a very fashion-oriented person). Yup, the very first day I wore them to work, someone actually noticed and commented how nice they were. Bought these to have some comfortable shoes that put up with a lot of walking, look nice and definitely aren't sneakers. It checks all of those boxes. These may be the most comfortable shoes I've worn. I wear them several times a week and do a ton of walking in them, and my feet feel absolutely fine.